Letter from Rev. Dr. Bateman to Rev. Mr. Renaud [Renoud] of Whitchurch, describing 'an extraordinary Cure performed by the use of Clivers otherwise Goose Grass',which took place in the writer's parish, in the form of a copy in the hand of Dr Christopher Douglas of Kelso as sent to Cullen by Douglas on behalf of Mrs Baillie at Mellerstein as an enclosure in Letter ID:814. The date of 1771 is not necessarily the date of the actual cure but indicates when Douglas made the copy. The precise status and origins of this letter are obscure since a version, dated 1 September 1783, was printed in The Gentleman's Magazine, in 1790, (Volume 60, Part 2), pp. 1164-65. Summary Letter from Rev. Dr. Bateman to Rev. Mr. Renaud [Renoud] of Whitchurch, describing 'an extraordinary Cure performed by the use of Clivers otherwise Goose Grass',which took place in the writer's parish, in the form of a copy in the hand of Dr Christopher Douglas of Kelso as sent to Cullen by Douglas on behalf of Mrs Baillie at Mellerstein as an enclosure in Letter ID:814. The date of 1771 is not necessarily the date of the actual cure but indicates when Douglas made the copy. 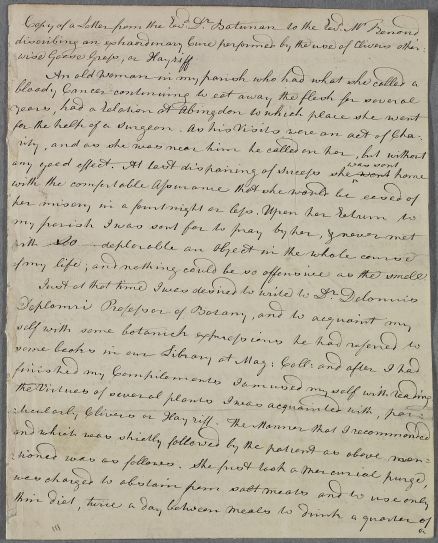 The precise status and origins of this letter are obscure since a version, dated 1 September 1783, was printed in The Gentleman's Magazine, in 1790, (Volume 60, Part 2), pp. 1164-65. 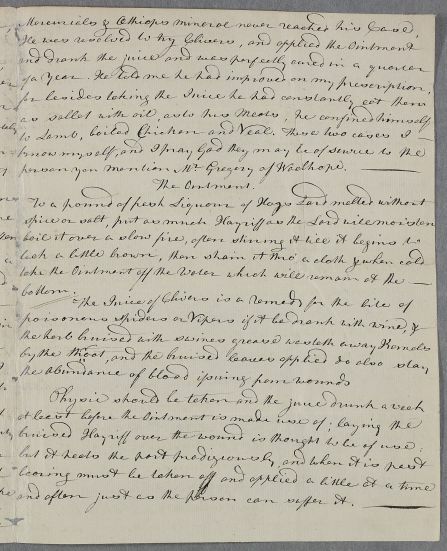 Case of 'an extraordinary Cure performed by the use of Clivers otherwise Goose Grass' communciated to Cullen by Mrs Baillie of Mellerstain, through other parties. of my life; and nothing could be so offensive as the smell. the abundance of blood issuing from wounds. 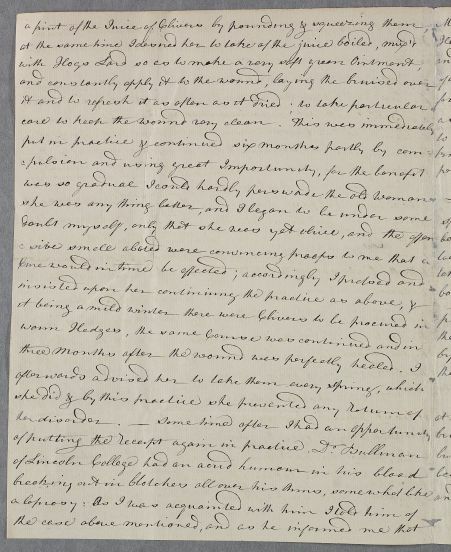 1: See general head-note for the context in which this document reached Cullen.